A CPA is a certified public accountant licensed by the state. CPAs are granted the designation only after they have passed the Uniform CPA Exam. The exam is comprised of four parts and is administered by the State Board of Accountancy. Eligible candidates must also graduate with a baccalaureate or masters degree from an accredited college or university and complete at least 24 semester credits in accounting. CPAs must meet continuing education requirements. Once an individual has received a CPA designation, he or she must then complete 80 credits of continuing education every two years in order to maintain the CPA license. CPAs follow a strict code of ethics. In addition to education and licensing requirements, members of the Michigan Association of CPAs are bound by a strict code of professional ethics. Why can’t you tell me exactly what my return is going to cost? How much time it takes to prepare your return. The types of forms and schedules included in your final return. Why does a staff person need to touch my file? I only want to work with a certain person. By involving multiple levels of staff, we deliver a higher quality return. Like most CPAs, we have a process that starts with a review of client records against prior year returns. We use a checklist and an organizer to perform an in-depth assessment of the client’s current year situation, and then compare current year tax records to documents provided in prior years — all of this just to start the preparation process. The draft return is reviewed by senior staff to determine if there are other issues that need to be addressed or planning opportunities for the future. Once complete, we do a final quality-control check before delivering the returns to the client. This is a comprehensive process that provides for consistency from year to year and also ensures that big issues or changes are addressed. Why can’t you do my tax return while we wait? A CPA does more than just collect forms, enter numbers into a computer, then deliver a tax return. CPAs typically start by comparing the current year’s information to the prior year returns and, for new clients, looking over several prior returns to get a good understanding of the client’s situation. Many follow up with additional questions based on information revealed during a detailed review. These questions form the basis for recommendations to “fix” an error or issue based on prior year filings or planning strategies that could save taxes in the future. The CPA may go through one round of Q&As or several rounds — as many questions as it takes to feel satisfied that they have covered everything relevant for that tax year. Why do I have to e-file my return? Starting in 2011, the IRS required tax return preparers who prepared more than 100 returns for compensation to file all the returns they prepare electronically. Starting Jan. 1, 2012, that number changed to 11 or more returns. So we e-file all returns, unless they do not qualify for electronic filing or contain forms that require paper filing. Of course, as the client, you can opt out and choose to mail your return to the Internal Revenue Service yourself. But we cannot make that decision for you. I don’t trust the IRS. If I e-file my return, does that mean I am more likely to be audited? This is a common misconception, but it is more fiction than fact. By electronically filing your return, you eliminate the risk of processing or data entry errors, get your refund faster, and reduce the possibility of computational or math error notices from the IRS. Although, it does not guarantee that you won’t receive a tax notice, it certainly reduces the risk of certain notices since the information contained in the electronic file, as prepared by your tax return preparer, is seamlessly integrated into the IRS system for processing. With rare exception, what we put into the system is what they process upon receipt. Our fees for preparing a tax return are based on the services we provide today. A notice does not mean a mistake was made on your return. We don’t charge to review a tax notice to determine what steps, if any, are necessary to respond. If additional work is necessary, we will recommend an action plan and provide an estimate of our fees if you would like our assistance. If you get audited, however, it can be for a number of reasons. A significant amount of time is necessary to review the audit notice, gather additional documents, respond to the IRS request for information, conduct any required research, meet with the revenue agent or revenue officer, and conduct any meeting follow up. We prepare the tax return based on the information provided, but there are a number of reasons you may receive a notice. Because of the significant amount of time involved in an IRS audit, our fees for this service vary depending upon each individual situation. After we filed our tax return, we realized that we missed claiming the American Opportunity Credit for paying our son’s college tuition last year. Our joint income is less than $160,000, so we qualify. Is it too late to claim the tax credit? No, it’s not too late to claim the credit, which can knock up to $2,500 off your income tax bill. Filing an amended return is easy at Hunter CPA Group. 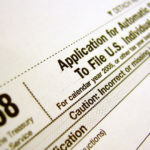 Generally, you have up to three years after the date you filed your original federal tax return to amend it, but the sooner you file, the sooner you’ll get a refund. You can file an amended return for any deduction or credit you discover you’ve missed during that time period. Reducing your federal tax bill could also lower your state income tax bill. File your amended federal return first, get a copy of the transcript of your account from the IRS (confirming you amended your federal return), and then file an amended return with your state, along with a copy of your federal Form 1040X.